Friday April 5th 1878. I was busy sewing on my brown dress all day and in the evening. Hatt went over to Wins to spend the evening. Saturday April 6th 1878. I was busy sewing all day. I finished my brown dress before noon and cut out an overskirt for Mother. I got it done and the skirt to her brown dress fixed before bed time. Weather pleasant. 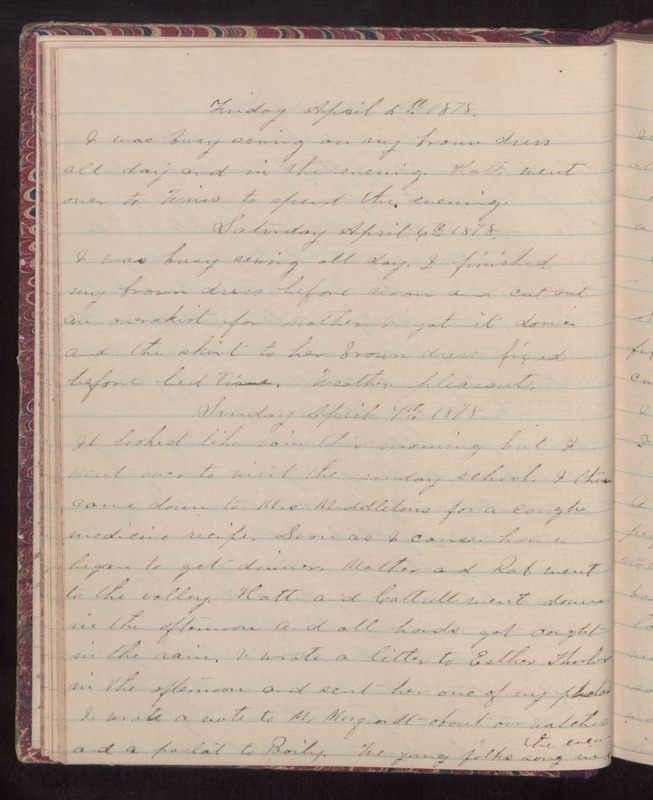 Sunday April 7th 1878 It looked like rain this morning but I went over to visit the sunday school. I then came down to Mrs Middletons for a cough medicine recipe. Soon as I came home began to get dinner. Mother and Rob went to the valley. Hatt and [Cattrell?] went down in the afternoon and all hands got caught in the rain. I wrote a letter to Esther [illegible] in the afternoon and sent her one of my photos. I wrote a note to Mr [Marginall?] about our [watches?] and a [paslat?] to Baily. We young folks sang in the evening.